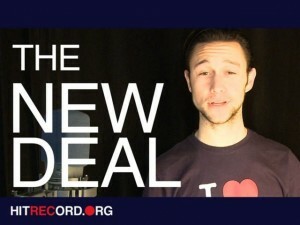 Joseph Gordon-Levitt, best known for his acting gigs, has been working on a side project since early 2010 – HitRECord. He describes HitRECord as an “open collaborative production company” that works with movies, music, art, and writing. By creating a free account on the site, anyone can upload any creative content (a.k.a. “RECord”), making it available for other users to mix, sample, or add on. This project is different from sites like YouTube, which allow users to share and view content. Rather, HitRECord aims to encourage online collaboration – it is less of an exhibition space and more of a studio for artists to work together. The concept behind this project is to address the exclusivity of Hollywood and mainstream cultural industries by creating a space where anyone can take an active role in the creation and production of content. The success of the project is demonstrated by the content it has already produced. Last year, HitRECord released an anthology of works including music, a DVD of videos, and a book of writing and visual art. HitRECord content has been showcased at SXSW, Sundance, and the Orpheum Theatre in LA. A 3-book deal was also recently signed with an imprint of Harper Collins. HitRECord is a project that found a way to work within legal limits while making cultural and artistic production more accessible to the public. More importantly, it brings a social aspect to art-making by fostering a sense of community and collaboration between users online. Check out the HitRECord website for more information about how it works, browse through some of the recent collaborations, and get involved!